The fin whale is the second largest animal in the world, and that is no small accomplishment. You have likely heard them called the razorback which is a common nickname. This is due to the grooves and plates that design their bodies. They are more than 65 feet in length and believed to weigh about 73 tons. There has never been a successful weigh in of these mammals so that is just an estimate. You will notice that the Fin Whale features a dorsal fin and flippers. It also has a wide tail with a notch at the center of it. The Fin Whale is very symmetrical which is a characteristic that you won’t often find among whales. Many people find the Fin Whale to be one that is fun to watch. Make sure you are ready to get wet though if you are close. They love to leap completely out of the water as they come up for a breath. This process allows them to dive back down approximately 800 feet into the water. They are also among the fastest of all whales too. They can move at a top speed of about 25 miles per hour. They tend to create small groups from 6 to 10 individuals. During the period of migration though it is possible for them to form a group that is close to 100 members. The Fin Whale isn’t very picky when it comes to the foods it consumes. Some of the most popular foods that it eats include small fish, squid, and krill. The plates and grooves of this whale allow it to consume its food. When it is eating the throat expands to allow it to take in more food. What isn’t edible to them is then filtered back out. They will consume approximately 4,000 pounds of food each day. You can find these whales in all the oceans around the world. They do tend to favor the tropics but you can find them in the Polar Regions as well. The majority of them though seem to spend most of their time in the cooler waters. It is believed this is due to the food sources being more plentiful there. Reproduction takes place during the winter. It takes about 11 months from conception for the new baby to arrive. Calves measure about 21 feet in length. They are believed to weigh about 4,000 pounds at birth. Almost all whales only have one baby at a time with an occasional set of twins. It has been documented that the Fin Whale sometimes has up to six babies at a time. The Fin Whale has been hunted for many decades. As the development of faster boats and more advanced tools came along, they found it harder and harder to escape such hunting efforts. As a result of those efforts it is on the list of endangered species. One of the biggest threats to them right now with humans has to do with the collision of ships that are all over in the oceans. They can severely injure or even kill a Fin Whale depending on how hard it hits and with what part of the ship. There are aggressive efforts in place to protect the Fin Whale. Most areas around the world have agreed not to hunt it due to the limited numbers of them left. However, both Japan and Iceland continue to allow a certain quota of them to be killed annually. 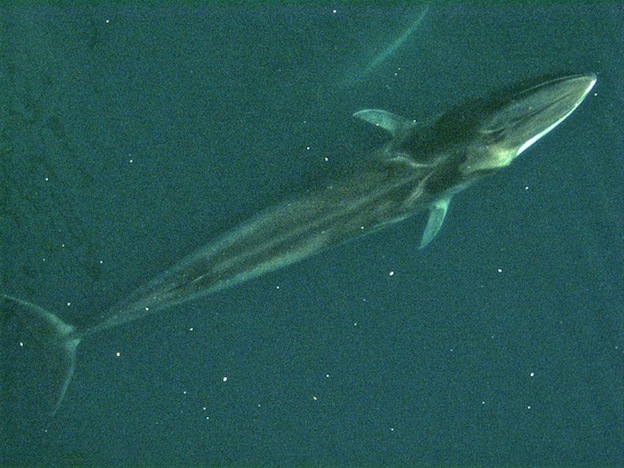 If these Fin Whales can be protected, it is possible for one to live more than 90 years in the wild.